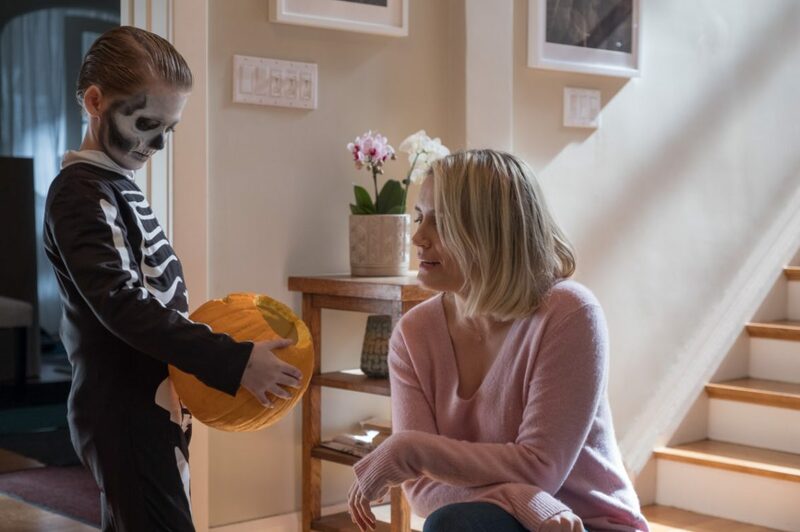 Aaron Neuwirth reviews The Prodigy, a new creepy kid movie that does enough to get by, even if you know where things are headed. Sometimes a film is exactly what it looks like, and that’s okay. The Prodigy falls in the line of creepy kid movies where the evil is seemingly in plain sight, but there’s only so much you can do when dealing with a young child. With a small budget, few characters, and a premise that was familiar enough to inspire a poster playing on nostalgia, it’s up to the filmmakers to craft something compelling enough to keep an audience invested. I can’t say The Prodigy works as the most chilling take on this type of story, but it was entertaining. Following a prologue surrounding a serial killer to set the stage for events that will add up later, we begin to follow Sarah and John (Taylor Schilling and Peter Mooney), the parents of a young boy who quickly shows he may be gifted. By the time he reaches eight years of age, Miles (It’s Jackson Robert Scott) is attending a special school focusing on his advanced intelligence. However, there’s something else going on with Miles. Something has him mumbling Hungarian at night and stalking around his house to raise suspicions. What could it be? To the film’s credit, director Nicholas McCarthy at least seems aware of the movie he is making. 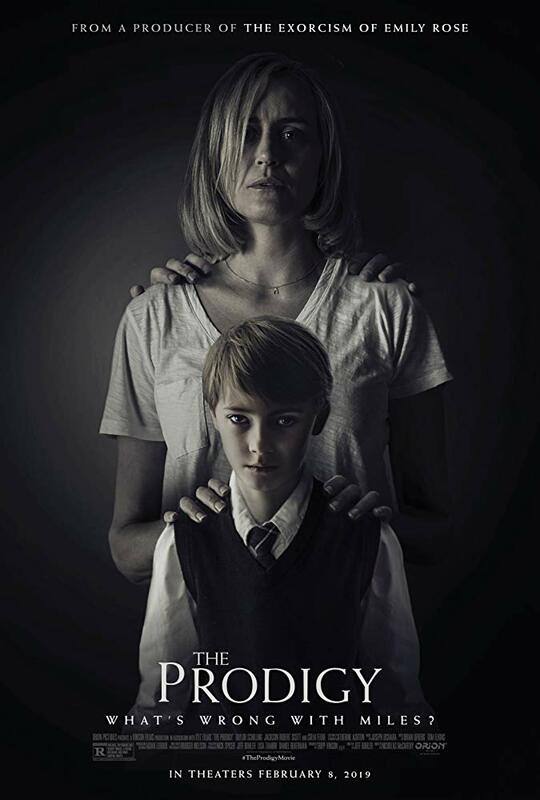 The Prodigy isn’t the sort of film that needs to wink at the camera, but filmmakers behind a film like this are hardly oblivious to the horror territory they are working with. For all the dread found in the tone of the film, and the seriousness of the characters, the camera is happy to play along. The requisite jump scares are here, popping up in the places we’d generally expect, but this film knows how to have fun with the buildup. Low shots of feet walking down stares make for a good way to raise dread. Holding on dimly lit rooms allows for our minds to play with us. Even Miles’ school for the gifted has the look of a sanitarium converted into a filmmaking space. The style isn’t handled in an over-the-top fashion, but there is something to enjoy in The Prodigy’s deliberate framing, showing McCarthy’s love of the genre. There’s also the matter of eye contact. Any creepy kid movie needs an actor who can either place the evil on their face throughout, while most inexplicably can’t detect it, or need to play it completely innocent. The Prodigy has young Jackson Robert Scott doing an excellent job of playing both sides. It’s not as though there’s much mystery to what is taking place, but I can still appreciate the dedication to having this kid do a lot with his eyes. Hard stares or even glances thrown towards his parents make for some nervous tension. Having him explain away possible dirty deeds by throwing on the face of a tiny child keeps one hoping for a positive resolution. Whatever the case may be, The Prodigy finds enough to keep things moving. It’s the sort of film where the audience may be at least a few steps ahead of any scare or new plot turn right before it happens, but enough watchable things are going on to keep an audience from growing restless. The cast plays a role in that. In addition to young Scott, Schilling does well enough as a mother desperately trying to understand what’s wrong with her son and pushed to extremes. Colm Feore steps in to add some gravitas to what we are seeing as a therapist with answers. Additionally, I do appreciate how Orion Pictures decided The Prodigy could stick with an R-rating. The film is not heavy on graphic violence, but I can see a scenario where enough edits could be made to make this film tamer. By letting it stand as is, there’s more to take in as far as the drama concerning the violent acts that do take place. The Prodigy never really approaches terrifying, but the violence that does allow for a bit more weight to add to the impact of certain scenes, as silly as it can be. That’s the rub. For all the enjoyment that comes from this little horror flick, it’s not doing anything to raise the bar. It doesn’t need to, but I still wish The Prodigy had more than reliable story beats to make it good for more than a one-time watch. 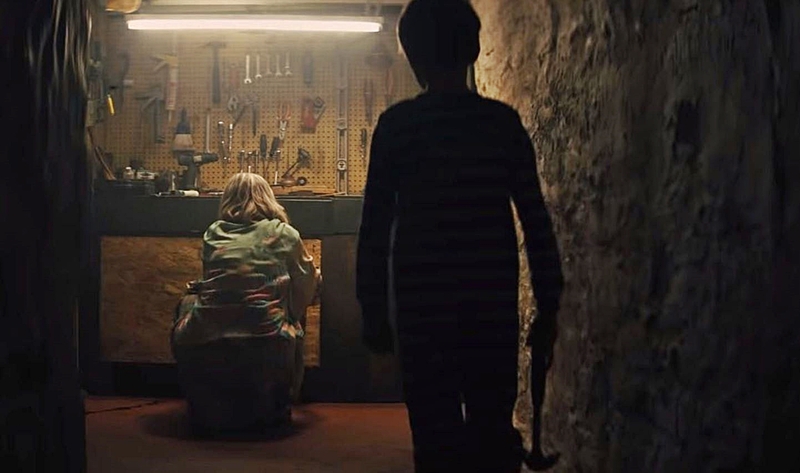 There’s not quite enough punchiness between the kid and the parents by the time everyone seems to be in on something being up, nor is there enough terror to make the film more than a decent enough exercise in crafting some creepy kid movie fun. Enough is going on in The Prodigy to keep it on the higher end of low-key early year horror releases, but it’s not bringing anything new to the table. The kid is sufficiently creepy, and the whole film is competently made. That’s enough to achieve for a decent fright flick, but this bad seed won’t quite remain your friend ‘til the end, just until the credits.